I include the feral rock dove/rock pigeon here because it is one of the most common dove species found in Tallahassee (after the mourning dove). Rock doves often make good pets and seem to be more relaxed in captivity than other dove species. 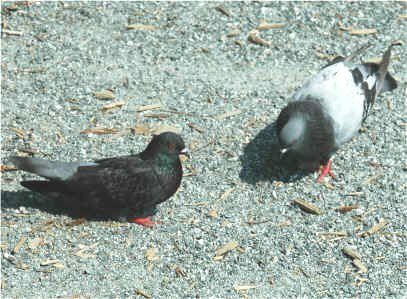 One day we were at a strip mall in town and saw a healthy looking rock dove sitting in the sun on the sidewalk in front of one of the stores. I approached him and he made no effort to walk or fly away. So I picked him up and he seemed absolutely unafraid. At first I thought he might be ill and was too weak to fly away. But he did not look sick, so I carried him back to the car and put him in the back seat. Then he was not very happy. After a few moments he found his way to the front seat and sat in my daughter's lap for the remainder of the trip home. Once in the house we fed him the finch seed we give the diamonds in the kitchen and left him on the side of the sink. After eating and drinking his fill he sat down, puffed up, rolled his wings under him, and went to sleep. Later we found him on the floor exploring. As before he was easily picked up and held. As the days went by he always was close to one of us and appeared to be quite happy and content. My daughters took him outside as if he was a cat or dog and the bird always stayed close. If they were playing on the front porch or rear deck, the bird would always be there with them, even when the neighborhood children brought their dog and cat with them. There was never any trouble with those three, but I would not have trusted other people's dogs and cats near the dove. The pigeon lived with us for a number of years, then one year we had to leave home for a week, and the people that were to supply food and water to our birds while we were gone did not provide the pigeon with enough water and he died. Strangely enough not one of our diamond doves died because of the lack of water. 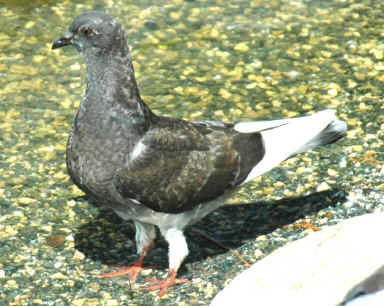 The white lower back of the pure Rock Dove is its best identification character, but the two black bars on its pale gray wings are also distinctive . The tail is margined with white. It is strong and quick on the wing, dashing out from the sea caves, flying low over the water, its white rump showing well from above. Feral Rock Doves commonly show a very wide range of plumage variation. 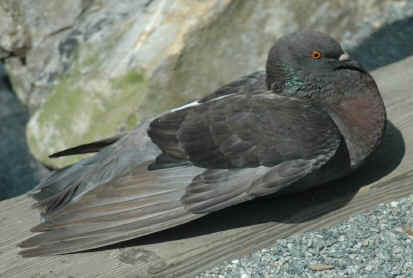 It also has been noted that the color patterns of the feral rock dove are often asymmetrical. Feral rock doves also have longer wings than the wild rock dove. The head and neck of the mature bird are a darker blue-gray than the back and wings; the lower back is white. The green and lilac or purple patch on the side of the neck is larger than that of the Stock Dove, and the tail is more distinctly banded. Young birds show little luster and are duller. 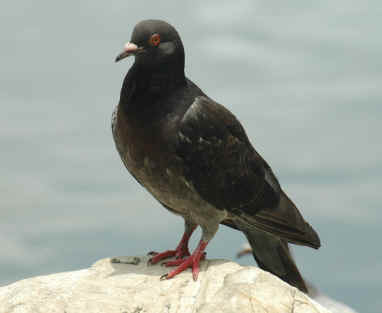 The wild Rock Dove has a natural resident range in western and southern Europe, North Africa and into southwest Asia. Its domesticated form, the feral pigeon, has been widely introduced elsewhere, and is common, especially in cities, over much of the world. 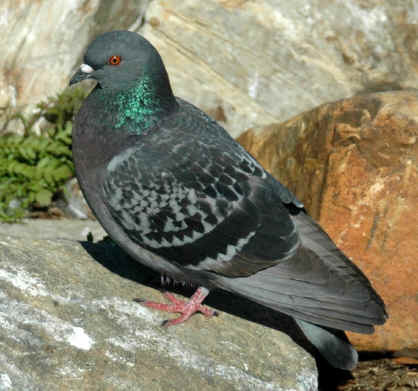 In Britain, Ireland, and much of its former range, the Rock Dove probably only occurs pure in the most remote areas. A Rock Dove's life span is anywhere from 3-5 years in the wild to 15 years in captivity, though longer-lived specimens have been reported. The species was first introduced to North America in 1606 at Port Royal, Nova Scotia. The habitat of the feral rock dove is mostly in cities where they nest on buildings, under various kinds of overhangs and open roof structures and frequent parks and other places were people go to eat in the open. The rock dove feeds primarily seeds of cereals, legumes and other weeds. It often visits fields for grain and other green foods. Like other doves it prefers to be near water and usually drinks after feeding. 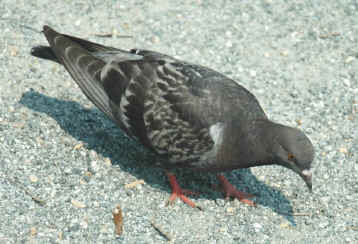 Feral rock doves often frequent parks and other areas where people eat in the open and look for scraps or handouts. They also are quite willing to be fed by hand and will closely approach any human offering food. In some parks they have been known to land on people's arms and heads when looking for food. If one person feeds them frequently, they will soon learn to recognize that person and approach him or her for a handout. One day I was walking down a street some distance from the park where I often feed the pigeons and a flight of about one dozen birds passed overhead at some altitude. When the saw me they made a sweeping circle and came around, descended, and landed on an electric wire above my head. Unfortunately I was not carrying any food with me at the time. "This was easier when we climbed up..."
Like most other temperate zone doves, courtship and mating usually occur as the days are increasing in length. Also like most other doves, once a pair of pigeons bond they will stay together for life. Courtship often starts with cooing and bowing, but the bowing is a little less dramatic than the diamond doves. The male pigeon will inflate his throat, displaying the metallic colored feathers on his neck, lowers his head and turns around in circles in the presence of the female he is courting. In some cases the male will slightly spread his tail when he runs after the female in short spurts. This is similar to the action the mourning dove males use in courting their females. Again like other doves, the pigeon will engage in "driving" where the male follows closely behind the female. Sometimes the male and female will exchange "kisses" which is a rapid light pecking around the head and the neck, often with their eyes closed. The female also will put her beak inside the males open beak which is called "billing". Diamond doves also engage in kissing and billing. And finally the male will mount the female and copulation will occur. Like most other doves, rock doves usually make a flimsy nest. The nest is usually on a building ledge, underneath a bridge, or under the roof of some open air structure. In a more natural environment the nest may be located on rock cliffs or in a cave. It is a slight structure of grass, twigs, or other plant material. As long as the parents are successful in raising their babies, the nest will be used over and over. 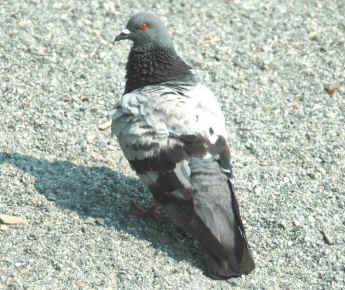 The female pigeon usually lays two white eggs. Rarely a female will lay one egg or even three eggs. The eggs are incubated by both parents for about 18 days. The female incubates the eggs at night and part of the day. The male incubates the eggs during the day giving the female time to get off the nest to eat and drink. The nestling has pale yellow down and a flesh colored bill with a dark band. Like other doves, the pigeon baby is given "crop milk" by its parents for the first week or so and then the parents continued feeding my mixing seeds with the crop milk until the are providing 100% regurgitated seed by the end of the second week. The babies usually leave the nest in about 30 days after hatching. By that time they are almost as big as the parents. One of the most interesting characteristics of the feral rock dove is that they come in many different colors. 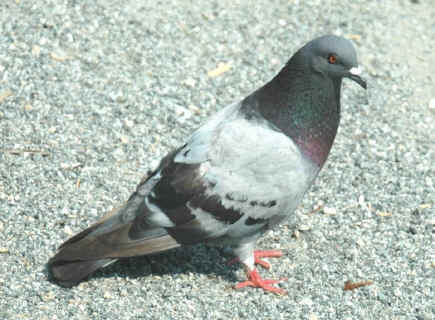 In fact, some pigeon fanciers, people who especially like pigeons can identify up to 28 different color morphs. Most of these color morphs include beautiful iridescence neck feathers that include shiny, metallic appearing feathers. Cornell University's Project PigeonWatch (1) groups pigeon colors into seven morphs. Blue-bar: This is the color and pattern of the original wild pigeons from Europe, Asia, and Africa. It is called blue-bar, even though these birds are not really blue. Blue-bars generally have a dark head, neck, and chest with some iridescence; a light-gray breast and belly; a black band at the end of the tail; and two black stripes or bars on each wing. In wild feral populations there are a predominance of this color pattern while in the towns and cities there is a greater variety color patterns. Red-bar: Some pigeons have the same basic pattern as blue-bars but these birds have a general reddish appearance. The black areas of the blue bar are replaced with a dark, rusty-red, or brown color. Since these birds are similar to the blue bar color pattern they are called red-bars. 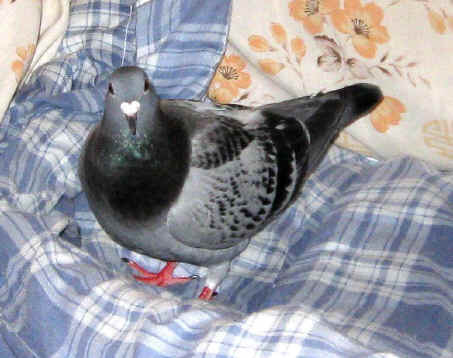 Blue Checker: Pigeons that have a patterns on their wings similar to the bird in this photograph are called checkers. The wing bars are usually wider than the blue bar. 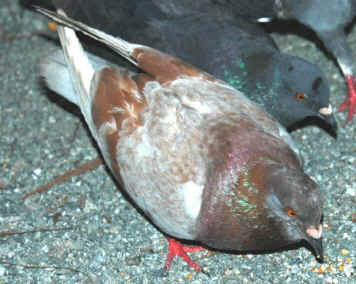 There is considerable variation, with pigeons that range from very light gray with only a few black checks, to very dark with only some light-gray still showing. Derek Goodwin reports that this pattern is the most common in the pigeons found in London. (3) Red Checkers can be found but I do not have any photos of these birds at the present. Red: Pigeons that have a dark red or rusty brown color over most of or all of their body, they are called reds. Red colors are usually infrequent in pigeons except where they have been derived from homing pigeons that were released. Locally there seem to be very few red bars and reds. Spread: The spread or black color pattern ranges from a black slate color to a slate back color and usually covers the entire body except for the metallic feathers on the neck. This color pattern includes black wing and tail bars similar to the blue bar. White: These birds are solid white. According to Goodwin (3), pure white birds usually only stay white in the first generation after release. Some white pigeons are albinos, with a pink beak, pink legs, and red eyes. The bird here may have been a descendant of a pure white bird, but since it now has some color it should be classified as a pied. But since there are no whites in our local flock at this time I include this bird here, since it is the whitest bird we have. 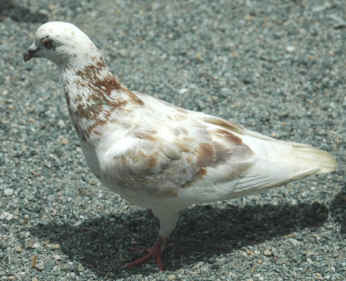 Pied: When pigeons of any color have white patches in various locations on their body they are called pieds. The pigeon in the photograph has white wing feathers but pieds may have white tails or white patches on their heads. In the local area there are a number of birds that have this white patches on various parts of their body. Some even have one wing white and another the natural color. If the bird you have found had a band on its leg then it probably is a homing pigeon or a show pigeon. The band number and letters can be traced though several pigeon organizations. If it is a homing pigeon its home could be hundreds of miles away. The pigeon may have become exhausted because of adverse weather or perhaps head winds on his way home. If you find such a pigeon and provide water and food for a few days it may be able to take off and continue on its trip home. But it would probably be best to determine if its home is nearby and to contact the owner if possible. If the pigeon is kept for show it simply may have gotten outside of its loft and can not find its way home. For either kind of pigeon the owner can probably be reached through the use of the band number on the bird's leg. Below are listed the primary pigeon association in the United States and Canada along with their organization code that appears on the leg bands, and their web sites. American Racing Pigeon Union Inc.
International Federation of American Homing Pigeon Fanciers, Inc. If you find a pigeon that has a band number and you need assistance in finding its owner please send me an email using the address at the bottom of the page. If it is a wild pigeon it probably will not be approachable unless it is ill or injured. 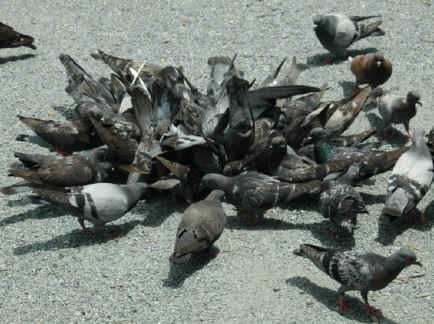 But it may also be a pigeon that obtains food in a park or some other location were people feed these birds.. But in the case where the bird is injured you should contact the local humane society. Since wild pigeons are not native species they probably will not be taken in by wildlife rehab organizations. For those that might be interested in keeping such a bird the services of an avian veterinarian could be obtained to correct most medical problems. Pigeons do make excellent pets and unlike other bird, in time, one can often take them outside like any other pet without fear of loosing them as long as they are trained to stay close. Most lost birds are hungry and thirsty. Water is extremely important for all pigeons/doves. Since pigeons drink by suction, any water container you provide should be at least 1 in. (2.5 cm) deep. The heavy glass flan cups that we use for all my other doves works well as it is heavy enough not to easily tip over. A thirsty bird may drink immediately, and it may not. Lost domesticated birds may be so exhausted, they don't even realize that water is in front of them, especially since the water container you are providing is different from the one they have used to Splashing the water will make a sound that will be recognized by most pigeons. Since doves are very familiar with the sound of water, they use water for bathing, they should easily recognize that it is there for them to drink. Gatorade or other commercial sports drink may be added to the water if the birds really appears exhausted and dehydrated. Two teaspoons in a flan dish filled with water should help. 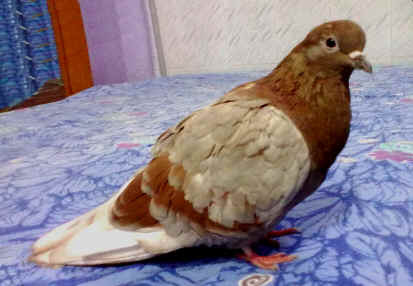 I find many of my doves will go after Gatorade after doing extensive indoor flying during periods of hot weather. Pigeons like most doves are grain eaters. The most readily available food source is a commercial blend of wild birdseed that can be obtained in most supermarkets . The food we use contains milo, millet, and black oil sunflower seed. Additionally, raw dried grain such as rice, pearled barley, split pea, or canary seed, make a good additive to the above mix or may be fed separately based upon availability. Water should be provided since pigeons normally drink immediately after eating. I feel the quickest way to catch a pigeon if you can get close enough to him, is to throw a sheet over him or some other light material. Often when they are feeding on seed on the ground they will be distracted enough where the sheet will land over them before they can fly away. Once that is done I take the bird inside holding him carefully inside the material and put him in a large bird cage or a box with some kind of grate over the top. Some pigeons are laid back enough so they can be handled once they are inside a home. Catching a pigeon will allow you to check for injuries and inspect the leg band so you can find the bird's owner. Some say the easiest way to catch a pigeon, if it is hanging around, is the old box with a stick trick� Prop up a plastic laundry basket with a stick tied to a string and put it over the feed that the bird is used to picking up. Many people will sit in a lawn chair with the end of the string in hand and read a book until the bird approaches. When the pigeon goes under the box to eat the seed, the string is pulled and the basket should fall down over the bird. Of course one must be careful that the bird does not escape form the basket until it is inside one's home. This can be done by sliding a thin board underneath the basket. The following section includes some stories from a number of readers that found a pigeon that needed a home or were injured and needed special care. It does seem that some people often release their pet pigeon and such a bird will try to find someone else that he can move in with. The first story is about a pigeon that I found in a strip mall shopping center. It was a cool spring morning when I found our pigeon on the sidewalk huddled in the sun in front of a store in a strip shopping mall. Watching from a distance the pigeon did not move when people walked past on the sidewalk. People were curious but apparently did not want to get involved. So I walked up to the pigeon and simply picked him up. He did not struggle at all and I wondered if he was sick or injured and was concerned about taking him home where he would eventually would have contact with my other doves. My young niece was with me and had many questions about the pigeon. I got in the car and put him in the back seat realizing that I was probably going to have to deal with cleaning up pigeon poop. As we started to drive home, the pigeon decided he did not want to sit in the back seat and climbed up between the two front seats and got onto my niece's lap and sat their quite content. My niece was surprised that the pigeon sat there and allowed her to pet him without being restrained in any way. The thought both of has had was that he must have been someone else's pet. When we got home we put him on the kitchen counter and brought him some wild bird seed and heavy glass container of water. He ate the seed and drank the water and then continued to eat more and more seed and finally laid down, rolled is wings underneath him and went to sleep. Later we found him on the floor exploring. As before he was easily picked up and held. As the days went by he always was close to one of us and appeared to be quite happy and content. My daughters took him outside as if he was a cat or dog and the bird always stayed close. If they were playing on the front porch or rear deck, the bird would always be there with them, even when the neighborhood children brought their dog and cat with them. There was never any trouble with those three, but I would not have trusted other people's dogs and cats near the dove. When ever he was outside with any of us and headed toward the door to go back inside, the pigeon made sure he was standing by the door waiting to go in. He was absolutely determined that he would not stay outside unless one of us was with him. The pigeon did not seem to be bonded on any of us as individuals, but he seemed to want us to recognize he felt he was part of the family and our home was his home. We had a large cage that he used at night and also when we were away from home. Other wise the bird was taken in the house and learned to stay on the side of the kitchen sink except when one of us took it while watching television, reading a book, etc. or when he was taken outside. The bird seemed very happy and all it wanted to do was to be close to one of us. The dove lived with us for a number of years, then one year we had to leave home for a week, and the people that were to supply food and water to our birds while we were gone did not provide the pigeon with enough water and he died. Strangely enough not one of our diamond doves died because of the lack of water. I have little information about this pigeon but I include the very short story here because of the beautiful photo some one sent me from Appleton, Wisconsin in the middle of winter. It was probably very cold as I have lived in northern Wisconsin for a year and a half and many winter mornings it was 30 degree below zero Fahrenheit. This man went to this store and saw the pigeon sitting there in front of the store and took its photo. He sent me a message asking white kind of bird it was and as I recall what should be done about it. I told him I thought someone may have disowned him although it did not seem that was the right time of year. to do such a thing. I told him what a good pet our pigeon had been and suggested if he would like to have a pet bird, this pigeon would probably make a beautiful pet. I did not hear from him again so I do not know the outcome. My niece was going to graduate school in Kentucky where she was living in an apartment with her ringneck dove and a roommate. One snowy winter day they were driving home from school and they saw an injured white dove on the side of the road. They stopped, picked him up, and drove on back to their apartment. We later identified the bird as a white Trenton homing pigeon. It had a band on his leg. The injured wing was badly mangled and they felt the only way this bird would survive was if the wing was amputated. The next day they brought home the needed supplies from school and performed the amputation of the mangled wing. After the operation they applied antiseptic, bandaged the wound, provided antibiotics, and put him in a warm hospital cage environment. He was not a happy bird and always acted angry when they approached his cage. But within a month he had recovered form the surgery and was allowed to wander around the apartment. They had to be careful not to put him up high on a table without close supervision as he would attempt to fly and fall with a thud onto the floor. The pigeon stayed with them their remaining two years of grad school and when they left my niece's roommate kept the bird as my niece already had her ringneck to care for. Sometime later my niece had the opportunity to bring the pigeon over to my apartment and I took a few photos. The bird was still not very friendly but he could be held for short periods. He had fun exploring the apartment and if he did something bad we would scold him and he would run under a chair and roost on the cross bar. This became his "safe haven" while he was here and we learned to leave him alone when he was under this chair. My understanding is the pigeon is still alive today and continues living with my niece's now ex roommate. A couple was driving home at dusk one snowy night in Indianapolis and they notice a pigeon flopping about on the side of the road so they stopped and picked it up and took it home. When they got home they really did not know what to do about the bird but they noticed at had a leg band. They called a friend and asked them if they could find out anything about the bird from the leg band number on the internet since they did not have a computer. Apparently they did some searches and ended up on this page and then sent me a message with the leg band number and asked if I could help them. I searched some sites that listed band numbers but nothing matched. Then I started to wonder if this pigeon belonged to a company that did "white dove" releases so I started doing searches for such companies in the Indianapolis area. I found one that was not too far from the location where the bird was found. I sent them a message with the band number and asked if this bird belonged to them. Within a few hours I received a message from one of the owners of the company and they said they had done funeral release that afternoon and was missing the bird that had that band number. So I gave them the email address of the people who wrote to me. But when the pigeon's owners contacted the people who actually found the bird, they said that the pigeon had died. The people that contacted me told me about the death of the bird and said the owners were going top pick up the bird's body the next morning. Later in the morning I received a phone call from the pigeon's owner thanking me for my part in the rescue process and I told her I was so sorry the bird had died. But she told me the bird had not died and was sitting in a hospital cage beside her computer at that moment. She did have a bad eye injury but the vet thought she would recover just fine. Nathalie Champagne of Montreal, Canada has been keeping diamond, ringneck, and cape doves for a number of years. One day when she was at work, one of the men that worked in their warehouse came and asked her to look at a bird that was sitting on the ground outside their building. She found that the bird was a pigeon and soon discovered that the bird had been shot in the chest and had an open wound. She got permission to take time off so she could take the bird to a veterinarian's office. After examination, the vet felt with proper treatment the bird might live. Nathalie took the pigeon home with her and treated her wounds twice a day for two weeks. The bird also had diet problems and soft stools and it seemed as if she would never get better. Over the subsequent months and several more trips to the vet, the bird gradually did recover and it was not long before she bonded on Nathalie. Later the band number was used to identify the owner of the bird and Nathalie decided to try and contact him to tell him about the fate of his pigeon. After some discussion he agreed to allowing Nathalie to keep the bird despite the fact that it was a descendant of a pair of racing pigeons that he had imported from Europe. The pigeon now lives in a cage when Nathalie is away at work, but when she is home, King is allowed out of her cage and is her constant loving companion. One day Pankaj Chibber (of Jhulass, Poonch district, Kashmir and Jammu state in India) came home and when he went upstairs he saw a pigeon sitting on the roof of his neighbor's house. He wondered about the bird and thus threw a small stone at it to see if it would fly away. It did not so he figured it had lost its way and had become exhausted or else it was ill. 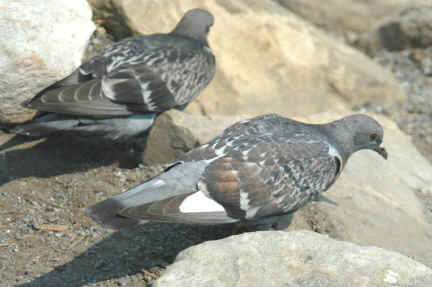 He indicated rock pigeons were very rare in his area although Gibbs, Barnes, and Cox (2) indicates pigeons are found to over 4000 meters elevation in the Himalayas. He climbed up on his neighbor's roof and tried to approach it, but the bird flew away but landed within 30 meters His flight was weak and he thus thought he could catch the bird with a little effort. After trying for seven or eight times he finally able to pick the bird up and then he took it back inside his home. He found it was suffering from watery stools and dehydration. He provided the bird with water and seed but it was not willing to eat by itself. Then he force fed it milk and seed for two days using an eye dropper and after that the bird did start eating on its own. The pigeon would eat seed off the floor and also out of his hand. He kept the pigeon inside for a month and after that he released it. But the pigeon did not want to leave. Three months later he was living in a box attached to his house under its roof. The pigeon goes away during the day for food but always returns before dark. Since that time he found two more pigeons living in an old fort and he brought them home and they are now residing inside his home. This beautiful white pigeon walked up Kate O'Riley's driveway in Los Angeles and apparently she figured she found a new home. Her wings were clipped so someone was probably keeping her as a pet. She did not have any bands on her legs so she probably was never used as a homing pigeon. She quickly became very tame and affectionate. In time her wing feathers grew out and she became quite proficient in flying. In fact she seemed to have some aptitude for flying in circles and other fancy figures. She is very friendly with the family members and seems to like being picked up and petted. However, like many doves, she is wary of any strangers that may come to the house. She eats wild bird food and really loves the sunflower seeds. She does live outside. The family built her a house with a door. She is allowed to fly free, but as the sun drops she usually flies back into her house and then wire door is closed for the night so she doesn't get attacked by the neighborhood cats, raccoons, opossums, etc while sleeping. She really likes music and dances on top of the radio on occasion. She has a big personality and she is adored by all members of the family. At this writing the pigeon has lived with the O'Rileys for about a year and a half. All the photographs on this page were taken around Lake Ella in Tallahassee, Florida by Helen White except for the pigeon found in Wisconsin, Nathalie Champagne's King Pigeon, Pankaj Chibber's pigeon, and Kate O'Riley's pigeon. Permission must be obtained from the photographer for any use of these photographs.